Research has suggested that the average person puts on 1lb a day during a cruise. A friend of mine on a Mediterranean cruise a few years ago had to have a large insert sewn into all his trousers by a Greek tailor, when the ship docked in Cyprus. But that need not be the case. 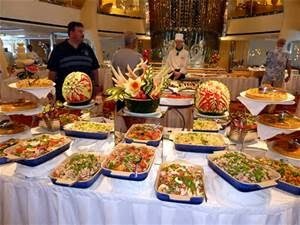 Let's face it many of us lean towards excess on holiday but it's fair to say that cruising has always been synonymous with food. Among the many preconceptions about cruise holidays is the notion that weight gain is inevitable. And with good reason. 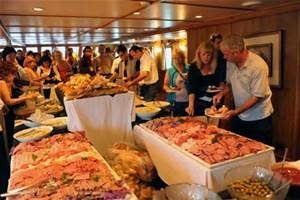 Not only is the majority of food served on board included in the price - meaning you can over-indulge without ever opening your wallet – the buffets on large ships are open 24/7 and there are frequent evenings events that focus on chocolate, 'sugary' cocktails and on-the-deck BBQ's. But just a couple of eggs, bacon and sausages and a hash brown and you have notched up 700 calories before the day has begun. And don’t fool yourself that eggs Benedict is the healthy option: the eggs might be poached instead of fried but factor in the bacon, muffin and Hollandaise sauce and you’ve notched up at least 418 calories. 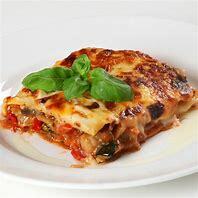 And has for choosing which main course to have at supper - the waiter will bring both choices, no problem!. Don't forget that maybe you'll just about manage the cheese plate after scoffing a chocolate soufflé groaning under its own calorie count. Why not head for the midnight chocolate buffet. Many ocean and river line lines DO now offer excellent salads, low-calorie dressings, "light" lunch options, round-the-clock fruit and low-calorie and diabetic desserts, not to mention impressive gyms. Yet even in more health-conscious times cruise companies celebrate over-indulgence. When Princess Cruises launched Royal Princess in 2013, the cruise ship named by the Duchess of Cambridge, it proudly unveiled the first pastry shop at sea. And it will take a strong soul to resist the temptations of master patissier Eric Lanlard, who will be raising the calorie count on board P&O Cruises' new ship, Britannia. One slice of his Black Forest Gateaux and you’ve consumed 804 calories. And that’s before any afternoon-tea sandwiches (300 for a smoked salmon sandwich) and scones and cream (268). The promenade on Royal Caribbean's Oasis and Allure of the Seas feature donut, cup-cake, ice cream and burger outlets. A burger and chips in Johnny Rockets fast-food joint on Royal Caribbean's ships? That’s a whopping 1,330 calories (for the basic ‘original’ burger), or more than 2,450 if you can’t resist the onion rings and a Coke as well. And then there's alcohol to consider. A poll of 3,000 Britons last year suggested that an average cruise passenger consumes 42 bottles of beer, 16 cocktails, seven bottles of wine and two glasses of champagne on a single voyage. 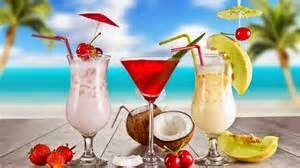 A bottle of wine is around 622 calories, a G&T 179, a bottle of beer 142 - you're looking at more than 13,000 calories during a single trip (or even more if you opt for that fruity Pina Colada cocktail - 645 calories - instead of a G&T). Given the recommended daily calorie intake for men is 2,500 and 2,000 for women, it’s no wonder that, according to a 2012 survey, more than half of cruise passengers put on around a pound a day – and that’s a conservative estimate. One cruiser posting on an online forum confessed to gaining 5lb on a three-night cruise. Many passengers pack larger-sized clothes for later in the trip or stop off at the tailors in Larnaca! Yet IT IS possible to maintain your figure - or even lose weight on a cruise. 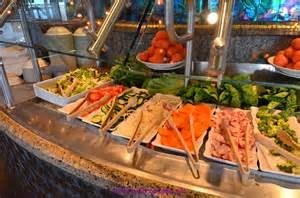 Stick to two meals a day, choose the salad option at lunch (avoiding creamy dressings), skip the bread, eat fruit instead of desserts and seek out the cruise lines with healthy menus and you're half way there. Menus in the main dining room and in the Princess and Queens Grill restaurants on board Cunard's three ships have Royal Spa dishes that detail calorie, fat and fibre content. And all restaurants on Crystal Cruises' two ships offer a three-course low-carb menu and dishes free of trans fats. While Royal Caribbean has devoted an entire restaurant on its new ship, Quantum of the Seas, to healthy eating. It's a premium dining option, and so incurs a charge, but all of the dishes served in Devinly Decadence, inspired by NBC celebrity chef Devin Alexander, are under 500 calories. Lunch or dinner costs £9 or £13 respectively. But you needn't fork out on a spa-suite or joining the on-board gym, just use the stairs instead of the lift. It’s tough for the first couple of days, especially on the ships with 14 or more decks, but it soon gets easier. Choose excursions that involve walking. Hebridean Island Cruises has Footloose cruises with complimentary guided walks most days while Rambler's Holidays offers cruises on Fred Olsen ships.Sign up to the keep-fit classes cruise gyms offer. Aerobics, aqua classes and stretch sessions are usually free. 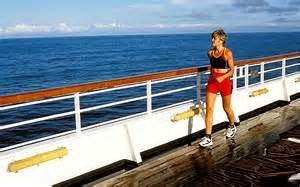 Seek out your ship’s jogging track, as my wife does every cruise. 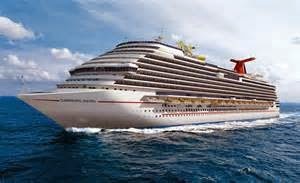 Seven laps around on Carnival Sunshine equals one mile. And you’ll enjoy sea air and good views in the process. In short, there is no reason why you must put weight on on a cruise. It's about choice and resisting temptation.